It is pleasing to be able to report on another very well supported and successful choir reunion, with a healthy attendance of 44, including 37 ‘choirboys’. 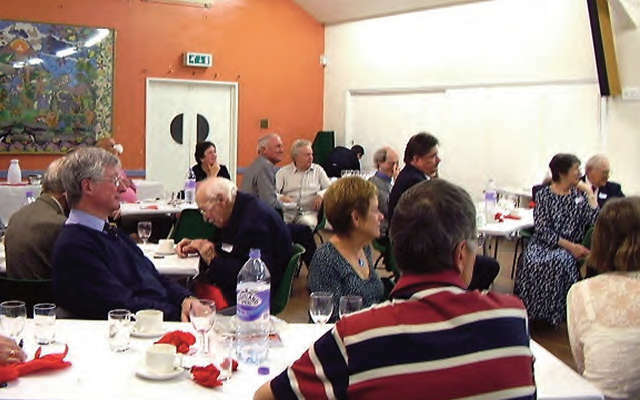 This was the twelfth such event since the very first one back in 1997 and during that time, a total of 115 former members of the choir have attended on various occasions. There is obviously a small group of ‘regulars’, who have attended nearly all the events, and they would probably cancel anything that cropped up on the same day, to make sure that they were present. However, it is always encouraging to see new faces from time to time and with the total now well over 100, it is clear that there has been a steady flow of new ‘old’ boys in recent years. 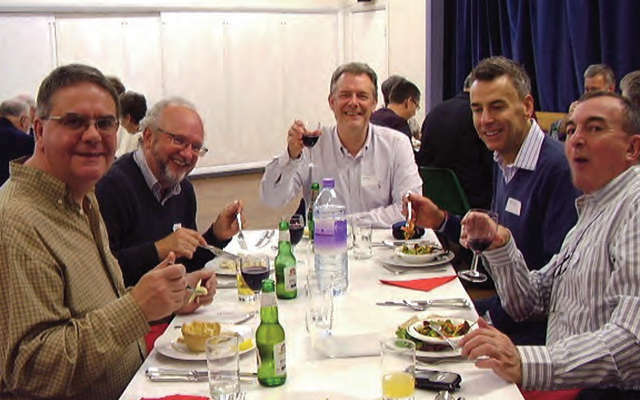 Everyone had a great evening, although as the years progress, we are reaching a point where it is inevitable that there is an increase in the number of absent friends. This year, the most notable absentee was Martin Lince, who sadly died in July. The choir was well represented at Martin’s funeral and tributes revealed that he had been blessed with a number of abilities beyond his natural aptitude for teaching. It goes without saying that he will be sadly missed. Fortunately, Martin’s wife, Mary, was able to attend and she seems to shrug off her advancing years with the greatest of ease – truly an example to us all. A very tragic story prevented one ‘ever present’ attending. Unfortunately, a loyal choir member was unable to be with us following a family tragedy when his son-in-law was killed in action in Afghanistan in August. We hear about our troops losing their lives far too regularly, but this news really did bring it far too close to home. Nigel Spearing is a familiar name to everyone, but he was unfortunately missing this year, as the dementia he has suffered with for a few years had got worse and his wife had explained that it would probably be best for him to stay at home. The evening is never quite the same without the sight of Nigel arriving on his bike, none the worse for wear after his 10-mile cycle across London, regardless of the weather! Looking back over previous reunions, it struck me that not only had we been gathering to honour the unique situation we were lucky enough to be part of during Russell’s ‘golden years’, but also the fact that we were all such really genuine good friends. I think what brought this to mind was that I remembered that the caterers had remarked on what a wonderful atmosphere there was in the hall and the two previous caterers we had used had also made similar comments. It is very rewarding to know that while we are all enjoying ourselves, complete outsiders feel that they can enjoy the evening, despite the fact that they are working! Wandsworthians Memorial Trust. It is greatly appreciated by us all and helps enormously in keeping us going each year. As is customary at the end of the evening, we had to call ‘time’ on those who hadn’t noticed how late it was, but of course the main consolation was that we could all meet up again next year. 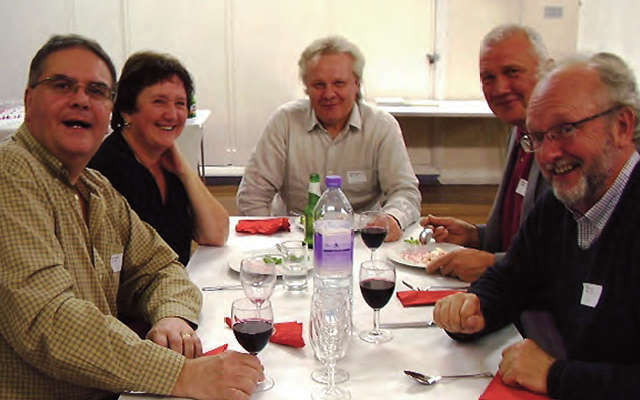 Mary Lince, Peter Love, Pat Morgan, David Munden, John Munden, Michael Nicholls, Barry, O’Shea, Anne Painter, Mark Painter, Geoff Park, Graham Preston, Ray Pritchard, Pat Read, Brian Sawyer, Fred Shaub, Andy Smetham, Rob Smith, Juliet Solomon, Mark Stevens, Andy Stonebridge, Geoff Wake, Richard Walmsley, Alan Woods, Ian York.